What action can you take right now to bring your creative work to life? Creativity is not something “magical” : it’s just part of YOU. It’s who I am, who you are. You Are Creative. We are just bumping into creative blocks everywhere. The biggest one is self-consciousness: we overthink the way we do things. We’re afraid to screw up and we get to hate what we make, we’re terrified others will hate it to and we hide away… We think others will find us a talentless amateur. There’s a great course going on in Sketchbookskool for the moment where Danny Gregory talks about this :“Exploring” . So let’s stop sabotaging ourselves. And STOP worrying about what others might think of you and your art. Make stuff because YOU like it, for yourself, and have fun! I did some more drawings with twigs. They’re great because they give myself the permission to draw with less precision, so I stop being obsessed about making a “correct” drawing! 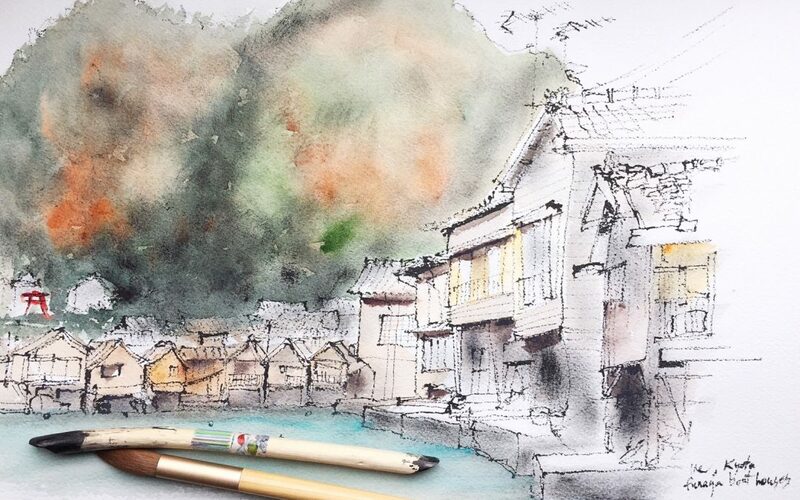 In the video below I show how I made a drawing with a twig, Chinese ink and watercolor in Ine, Kyoto, Japan. I dip the twig in a small container with gauze and Chinese ink and draw straight on the watercolor paper (Saunders Waterford rough paper, 300 grams). After finishing the drawing I make some shades with a dry rough brush and ink, and I finish by adding the watercolor in the background and the water. I chose to leave the houses blank. I don’t know yet if this was a right choice. Maybe I should paint them as well? What do you think? And please share this with your friends if you think it can help them to live their creative life! Fabulous post! If I schedule something in my planner it usually gets done. Time to schedule the amount of screen time in my day and make a daily appointment with myself to sketch and paint. Thanks for the prompt, wish me luck! Thank you dear Barbara ! And : good luck !! !